Campus is a “liberal bubble”, right? During many discussions on the current political climate, the word ‘bubble’ pops up, as if by magic. It attempts to explain why some recent political developments—Brexit, Trump’s election, AfD’s success, etc.—appear to have come out of the blue. Often, this observation is appropriate. “Birds of a feather flock together”: It’s natural for us to stick to the familiar. However, in the age of social media, this tendency has reached a whole new level. We increasingly find ourselves in online bubbles which, due to Facebook algorithms and our own self-selection, are drifting farther and farther apart. On Tom Ashbrook’s NPR podcast OnPoint, guest Erick Erickson, a conservative blogger and radio host, observed: “We’re all spending a lot of time building ourselves into communities that look a lot like us, thanks to the Internet, and we are less and less focused on the physical person that lives next door to us.” He’s right—How many of us can say we really know our Niederschönhausen neighbors? No, smiling at the 250 bus driver and saying “Danke!” to the cashier at REWE do not count. It’s easy to construct a community of like-minded people online. Stepping outside this safe haven can be scary. You never know what you will find. But intuitively we know there can never be progress without discussion. This is true for both society and our own development. Change requires engaging in real disagreement, where the different parties have deeply rooted, contradictory opinions. Social change cannot exclusively happen online; we must also burst our online bubbles. Pankow Conversations is a well-intentioned attempt to reach beyond our established bubble. In cooperation with the Bezirksamt Pankow, we are organising three events this semester to bring students, residents of shelters, and the college’s neighbors together. Our first event took place the 9th of October at SPOK. 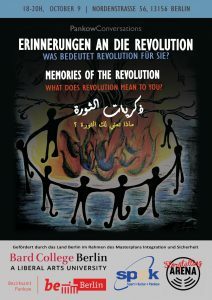 With the help of Story Telling Arena Berlin, we discussed the topic of revolution. Discussion was sparked by first hand accounts of The Peaceful Revolution in Germany in 1989 and The Syrian Revolution in 2011. Particularly striking was the openness with which Karam Alhamad told his story: “I may look like a Saudi, but I promise I’m Syrian,” he jokingly started. With this honest tone, he proceeded to explain the progression of the conflict in Syria and his own experiences as an activist. His detailed recounts made the story come to life for his audience, as well as brought many tears. While majority of the room was affiliated with Bard College Berlin, few had previously engaged with this experience, shared by many on our campus, in such an intimate way. Afterwards, we discussed youth activism and the impact of our individual bubbles on our perception of society. Many expressed a desire to engage with those whose opinions we do not often hear. Although conversation was fruitful, our aim is to involve a greater audience in future discussions, with a particular focus on the nearby shelters and long-term Pankow residents. The discussion also unveiled our internal differences. We must recognize we come from very different backgrounds and do not always share the same experience of the Bard College Berlin bubble. Some feel recognized within it, while others feel excluded. As Mandula van den Berg, a second year student, pointed out: “There is more diversity within the community than we might realise.” She stressed this diversity is worth exploring, too. “Even if we ultimately reach the same conclusions, we do so from entirely different starting points.” It would be empty to praise ourselves for our diverse student body without also engaging with what this really entails. We cannot pretend that 60 different national backgrounds melt together in one, unified experience of the world. If you feel locked up in your bubble or confused by recent political developments, this is your chance. 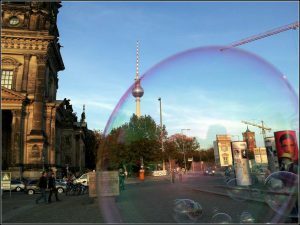 Bursting the bubble is going to require work—lots of it. Shying away from disagreement only hardens our prejudice. By confronting the unfamiliar, you learn from others and get to know yourself. Let’s try and make our bubbles drift towards and not away from each other. Pankow can be a first step; it’s up to you to take it. Interested? The next event will take place on the 15th of November on the topic of neighborhood and community. If you want to help organise or have any ideas, please contact: m.vannigonzalez@berlin.bard.edu. Otherwise, we hope to see you there!